St. A's Rube Goldberg Machine Contest team competed in an RGMC Regional contest at Mineola Middle School in Mineola, NY on March 9. 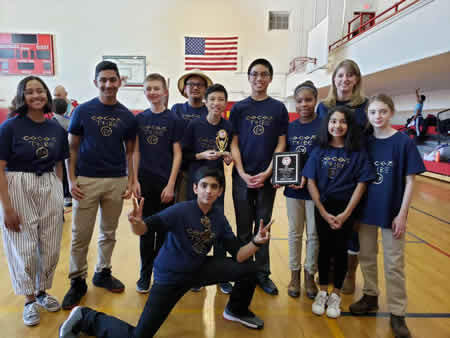 The team, known as the "Cocoa Tribe" to go with the theme of their machine, took home the Division I (Middle School) First Place trophy and also received the Spirit of Rube Goldberg Award, which is given to the team in each division with the most humorous machine and/or performance. The Regional win qualifies St. A's for their third consecutive appearance in the RGMC National Finals, being held this year at the Lawrenceburg Event Center in Lawrenceburg, Indiana on Saturday, April 6. Congratulations and best of luck in the Finals! 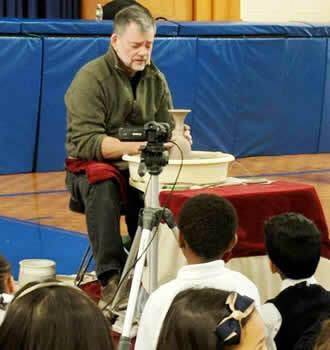 The Second Grade Students and their Parents spent a spiritual day as their Communion Retreat with Ray Boswell, better known as "The Potter". 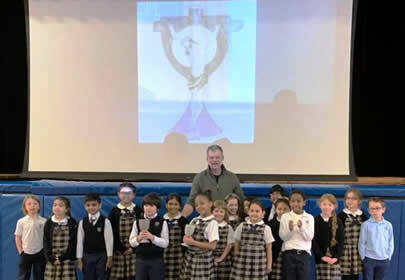 To remind our Second Graders of their First Reconciliation, Mr. Boswell used a video "The Lump" to explain how God's Love is infinite and how He is always forgiving us; no matter what we do. 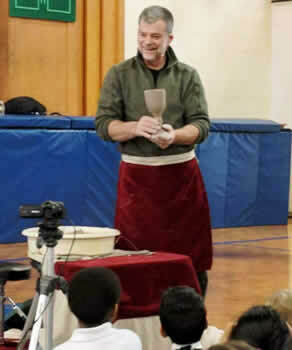 Then he began the process of making a Chalice out of an ordinary lump of clay, all the time reminding us of our strong connection to God. 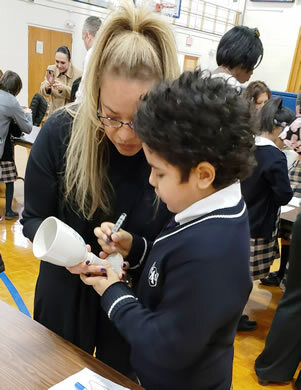 The students then got the opportunity to decorate a Chalice as a special memento of their First Holy Communion. Thank you to Mr. Falcon and any Second Grade Parents who contributed their photos. Please visit our Facebook page to see the full photo album from the retreat. Our Preschool had a very special visit from the Philadelphia Zoo On Wheels, and learned from the interactive presentation All About Birds, Mammals, and Reptiles and their Fur, Feathers, Scales and Skin. Our Kindergarten and Third Grade Students took the Reader's Oath after reading their favorite Dr. Seuss books together. Our National Junior Society Members led us in an assembly about Humility on February 22nd, which was National Be Humble Day. 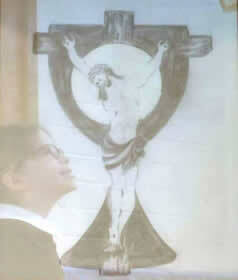 They used Sister Bernadette and Nelson Mandela, as shining examples of people living their lives as humble servants. All the students in Grades 5-8 took the pledge to be humble like the Saints, and were then asked to sign a "Be Humble" Poster, based on scripture from Philippians 2:3-4: "Do nothing out of selfish ambition or vain conceit. Rather, in humility value others above yourselves, not looking to your own interests but each of you to the interests of the others." We are so very proud of our NJHS students for organizing this event to make their fellow students more aware of how to be humble in all that they do. Even a snow day the day before could not stop our 8th Graders and their Kindergarten Buddies from celebrating the 100th Day of school on February 13th! As you can see, our Kindergarten students are 100 Days Smarter, as they impress their 8th Grade Buddies with their Math and Reading skills. 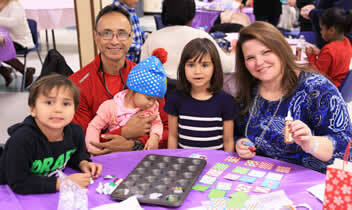 Our 4th Grade celebrated their Parent Day on February 6. 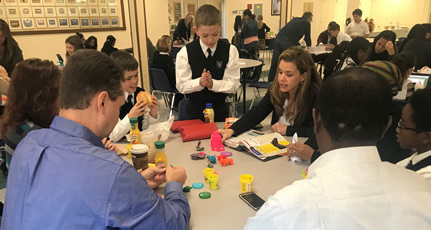 The students and their families completed a Valentine's Day service project for the Veteranss, two STEM projects including the use of a QR reader app, and the most favorite project of all was making the Thaumatrope, which is a Victorian toy constructed from a simple disk or card featuring a different picture on each side and attached to a straw. When the straw is twirled rapidly the card rotates on its axis and the two images appear to combine. One of the parents who attended Parent Day commented: "Both my son and I had great fun at the Parent Day yesterday, it was a great experience. Thank you for your tremendous efforts and dedication for an enriching experience. All the activities were so interesting and engaging, it was a fun filled and educational at the same time." 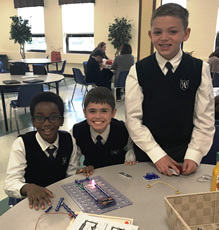 St. Augustine School joined with all of the Catholic schools around the US in celebrating National Catholic Schools Week from Sunday, January 27 to Friday, February 1. The week kicked off on Sunday with a successful Open House, and then began in earnest on Monday. Day 1 was dedicated to Our Lady of Guadalupe as we continue to observe the Diocese of Metuchen's Year of Spiritual Awakening for Consecration. 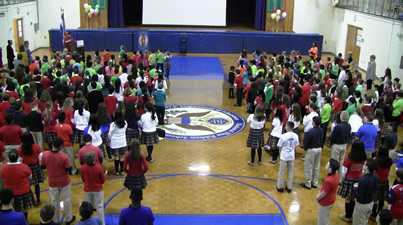 Students gathered in the gym for the opening prayer service wearing the colors of the flags of countries in North and South America to honor Our Lady's patronage of the Americas. 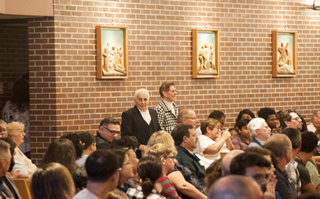 Following the prayer service, students and teachers made a pilgrimage around the whole school bestowing the blessing of Our Lady of Guadalupe upon each classroom. 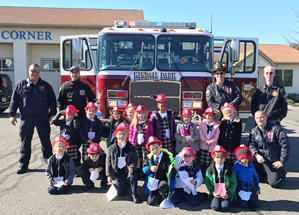 Day 2 was highlighted by a salute to our community heroes - policemen, fire fighters, emergency medical personnel, crossing guards, and the school medical and support staff. We were blessed to have several members of these organizations join us for a prayer service in their honor. Students read heart-felt compositions describing their heroes, and then each in turn was recognized by name and presented with a memento of their visit in gratitude for their service and sacrifice. 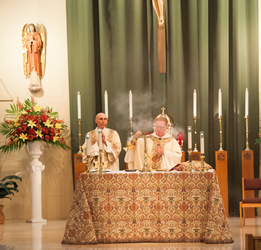 A video of the entire prayer service can be found on our Multimedia Gallery page. Days 3 and 4 featured our school-wide STREAM project, "Walk a Mile in My Shoes." 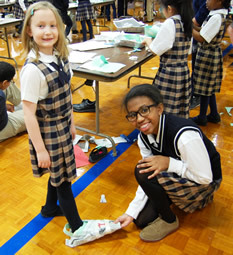 On Wednesday, the students were tasked to work together with a partner, using only a few simple materials like newspaper, scrap paper, felt, pipe cleaners, yarn, and tape to design and construct a shoe that was able to be worn, and removed, and did not need to be taped to the foot. The students showed great creativity and all used their collaborative skills to work together to design some awesome looking shoes! 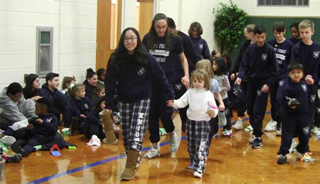 Then on Thursday, the students met with their partners to actually wear the shoes they had made and made a pilgrimage around the gym in order to know what it is like to "Walk a Mile In Someone Else's Shoes." They learned that there are those less fortunate than themselves who may never have a real pair of shoes to wear, and gave thanks for this blessing that many take for granted. 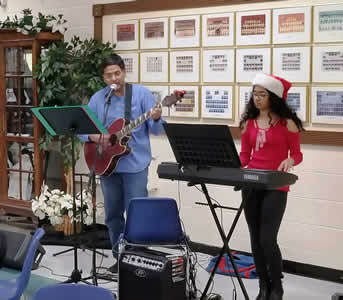 And finally, Day 5 brought an end to our Catholic Schools Week festivities. The day was highlighted by the traditional 8th Grade vs. 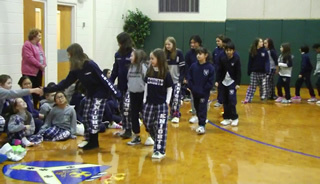 Faculty Games, a talent show presented by members of the faculty and staff, and one final tribute to Our Lady of Guadalupe as the 4th graders wore tilmas they had made bearing the image of Our Lady, thus bringing the week full circle. Sgt. 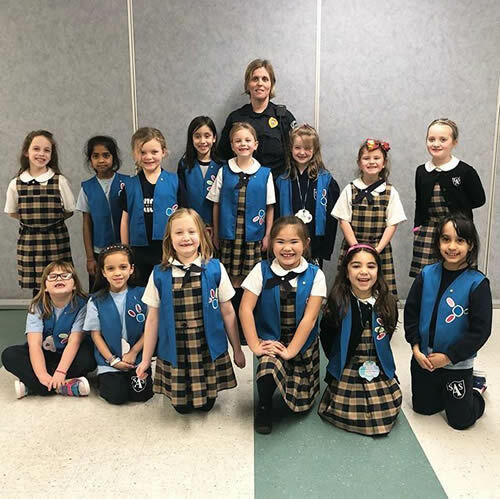 Tara of the South Brunswick Police Department and proud St A’s mom, helped our Daisy Scouts earn their “Respect Authority” badge. The girls had a blast learning what it’s like being a police officer. Thanks Sgt. Tara!!! You are amazing! STEM-TASTIC 3RD GRADE PARENT DAY! 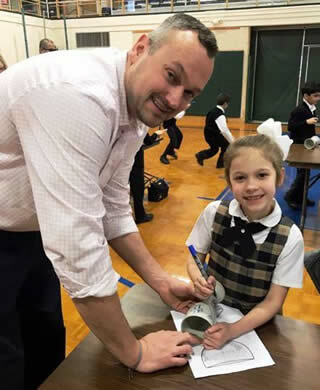 Our Third Grade Students and their Parents had a STEM-tastic Parent's Day, working on collaborative STEM projects. In Grade 3 White, the students and their parents worked on a STEM project using only marshmallows and toothpicks to create the tallest geometric shape they could create. They learned that stability was a key element in their structure. They had to keep supporting it in order for it not to fall or sink. They also learned a strong base made for a sturdy structure. Grade 3 Blue students and their parents collaborated on a seasonal STEM snowflake project. They worked together to create a symmetrical snowflake using the provided materials (craft sticks, pipe cleaners, toothpicks, and cotton swabs). The children were given a Snowflake Journal to complete. Each snowflake was beautiful and unique, just like each of our Third Grade students! For many, many more photos of this event, please visit our Facebook page. Our 8th grade students recently took a field trip to visit the United Nations Headquarters in New York City. They were given a guided tour of the UN complex and were very blessed to be allowed access not only to the General Assembly Hall but also to the Security Council Chamber, as a meeting of the UN Security Council had just ended 30 minutes prior to their arrival. As the tour came to an end, the students had the honor of meeting the Deputy Secretary-General of the United Nations, Amina J. Mohammed. Many, many thanks to Mrs. Felli for arranging this memorable opportunity for our students. 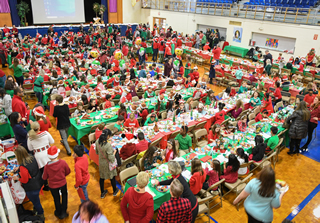 On Thursday, December 20, St. A's held its annual Christmas Brunch. 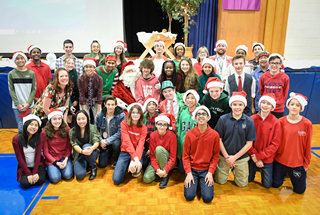 Students enjoyed a variety of treats, a Christmas Carol sing-along, and most of all, each other's company. Santa even took time out of his busy schedule to take photos with the students and deliver some special letters to the Kindergarteners. Many thanks to the teachers, staff, and all of the volunteer parents who helped to make this day possible. And a special "Thank You" to Mr. Lee for filming the time-lapse video that condenses the entire event into 1 minute and 32 seconds. 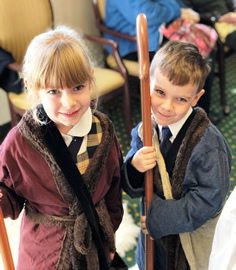 Our Kindergarten students brought the joy of Christmas Love to the Senior Citizens at Brandywine Living (Princeton, NJ). This is an annual event that our students participate in. Together the Seniors and the Students perform in a Living Nativity play titled "The Angel's Song", including LIVE animals as well! 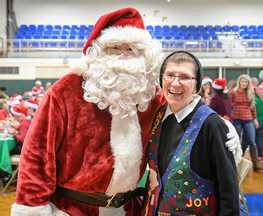 The children bring smiles to the faces of each senior they meet and talk to, and truly can see the real meaning of Christmas, as together, they tell the story of our Lord's birth on Christmas Day. Additonal photos from this event are posted to the full album on our Facebook page. Today's SPOTLIGHT ON STEM, is our awesome Tech Team. They were as busy as Santa's elves in the workshop, designing ornaments using the Tinkercad Program, and printing them out on our 3D Printer, just in time to hang on our Middle School Christmas Tree. Santa himself, would be very proud of these Tech Elves! 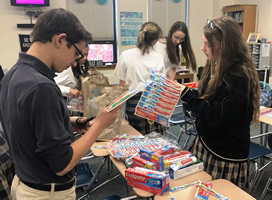 Our National Junior Honor Society (NJHS) and Student Council worked together to raise $600 to donate to the Women's Breast Center of Saint Peter's University Hospital to help those women who cannot afford to get a yearly mammogram. 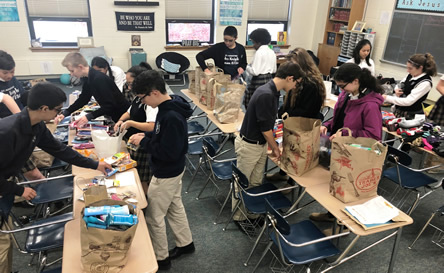 The proceeds were collected by the students during the Halloween candy buy back program sponsored by the NJHS, and a school wide dress down day hosted by the Student Council. 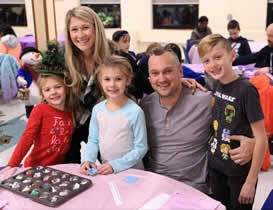 To celebrate the beginning of Advent, our HSA had an Advent Family Evening. After sharing an Advent Prayer Service together, the families got busy transforming muffin tins into awesome Advent Calendars filled with little treats for each day! The evening came alive with joy, as Christmas Carols were sung while Mr. Salins and his daughter provided the Christmas music for all to enjoy. Many thanks to our HSA, and all the generous helping hands, and to Mrs. Falcon, our Spirituality Coordinator, for providing our school families with a very memorable Advent Family Evening. Thank you also to Mr. Falcon for providing the pictures of the event. Please visit our Facebook page to see the full album with many more photos from this wonderful event. Today's STEM SPOTLIGHT is on Mrs. Pucci's Pre-Algebra Math Class. They are being tasked to use the Engineering Design Process to design and build a car using only a toilet paper roll, a sheet of cardboard, two straws and paper clips, and all held together by masking tape. Their end goal is to build a car that will measure the fastest speed, and then they will also calculate the mean and median speeds of their vehicle. Congratulations to our future Automotive Engineers! 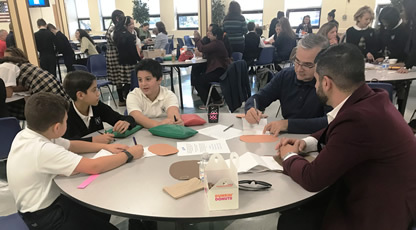 Our Sixth Grade Students celebrated Parent Day by enjoying some quality family time together, and rotated stations to complete their collaborative activities. In Language Arts, they completed Christmas Mad Libs and played the board games the students designed for a LA project. In Math, they had their choice of Math games to be played online using their Chromebooks, and for Religion, the families created a "good deeds" Advent calendar. STUDENT COUNCIL-LED PROGRAM CHALLENGES STUDENTS TO "BE A BUCKET FILLER"
Our Student Council Moderator, Mrs. O'Connor, and our Student Council President, Layna T., have introduced their new "Be A Bucket Filler" Program to begin on Monday, December 10. They based this recognition program on the book, "Have You Filled A Bucket Today?" written by Carol McCloud. This program encourages students to be "bucket fillers" and not "bucket dippers", by showing kindness, appreciation, and respect to each other. When someone is seen being a "bucket filler", anyone can fill out a ticket with their name, and then place it in the bucket that will be found in each classroom. At the end of each month, a random ticket will be pulled from each bucket, and that "bucket filler' will win a special award for filling someone else's bucket with a kind word, or good deed. With your help, we are creating a kinder, happier, and more bucketfilling world! 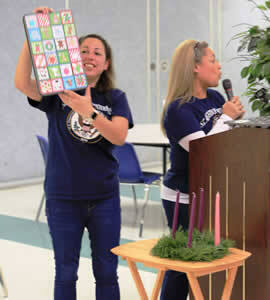 Our Middle School Students were led in an Advent Prayer Service by our Religion Teacher, Mrs. Paras. The students were first asked to choose focus words to prepare for Christ to come into their hearts during this Advent season. Then they wrote their Advent prayers to Jesus and they were placed inside a Christmas ornament. Our Art Teacher, Mrs. Minsavage, painted the chosen focus words on each of the student's ornaments. As part of the Prayer Service, ask student was asked to pray that they and others, would be able to focus on the important things that we will all need to receive as a gift from Christ during this special Advent Season full of hope, love, joy and peace. Special thanks to Mrs. Borowick, our Writing teacher for purchasing all the supplies for this Advent Tree Decorating Prayer Service. "Lord God, let your blessing come upon us as we decorate this tree. May the light and cheer it gives be a sign of the joy that fills our hearts. May all who delight in this tree, come to the knowledge and joy of salvation. We ask this through Christ our Lord. 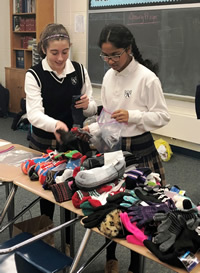 AMEN"
Mrs. Paras' Religion Classroom looked more like Santa's Workshop as the “elves” from the National Junior Honor Society sorted through all the generous donations from our St. A's samilies and completed 98 Blessings Bags to be donated to the HEART TEAM Service through Elijah's Promise in New Brunswick. The HEART TEAM will distribute these Blessings Bags to the homeless in New Brunswick. 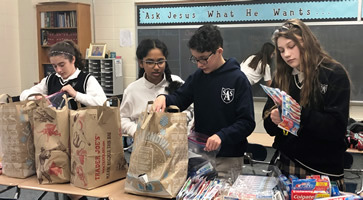 There were so many items left over that we are also able to make a donation to help single moms in Newark through a program run by Sister Mary Beth Lloyd of the Religious Teachers Filippini. Congratulations to our Robo Knights Team for their 2nd Place Win at the First Lego League Challenge. Each Challenge has three parts: the Robot Game, the Project, and the Core Values. Teams of up to ten children, with at least two adult coaches, participate in the Challenge by programming an autonomous robot to score points on a themed playing field (Robot Game), developing a solution to a problem they have identified (Project), all guided by the FIRST Core Values.FIRST LEGO League challenges kids to think like scientists and engineers. During the INTO ORBIT season, teams will choose and solve a real-world problem in the Project. They will also build, test, and program an autonomous robot using LEGO® MINDSTORMS® technology to solve a set of missions in the Robot Game. Throughout their experience, teams will operate under the FIRST signature set of Core Values, celebrating discovery, teamwork, and Gracious Professionalism®. Special thanks to coaches Marie and Jeff Lyttle who gave so much of their time to the students. Our kindergarten students and their parents celebrated Thanksgiving during their Parent's Day on November 15. The students came dressed as Pilgrims and Native Americans, and each family was asked to bring in a food donation for the local food bank. 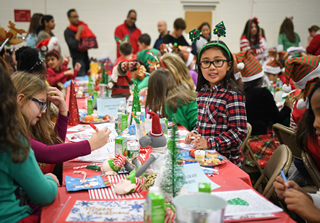 The families enjoyed a feast together, and rotated between six stations of collaborative projects. Each family completed a STEM/MAKERSPACE project of a structure that either a Pilgrim or Native American would have lived in, a roll-the-dice project to complete a turkey picture, a Math story that needed to be completed with the correct answers, designed and assembled necklaces out of noodles, and read and completed an activity about a Thanksgiving story. Lastly, each family was asked to compose their own prayer of Thanksgiving and write it on a pair of praying hands. We are most grateful for all our Kindergarten students, teachers, aides and their families. Please visit our Facebook page for the full album with many, many more photos of this event! 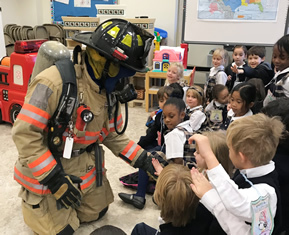 Our Kindergarten and First Grade Students celebrated Fire Safety Week with our Kendall Park Volunteer Fire Company, and Squirt. 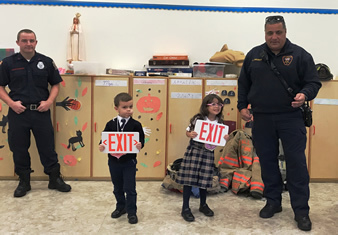 The Firefighters explained to the students how to call 911 in an emergency and to find the exits, and get out as quickly as possible. They also showed the students how to "STOP, DROP, AND ROLL." We are very grateful for all the support our South Brunswick Fire and Police Departments give us throughout the school year. May God bless and protect all of our South Brunswick Community Service Workers. St. Augustine School held its Annual Anti Bullying Program for the school year 2018-2019 on Wednesday, October 31st. 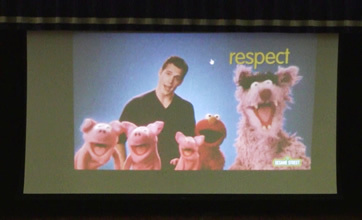 This year's theme was: CHOOSE RESPECT: Let us create a world without bullying and let us begin today....The characters from Sesame Street helped teach us about the meaning of RESPECT and how we can show it to everyone we meet. 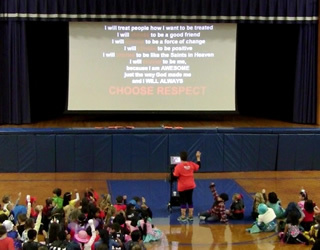 Our Teachers even had a message for their students, and sang and danced to the classic R-E-S-P-E-C-T song. Our 8th graders led us all in the CHOOSE RESPECT song by Andy and the Odd Socks. 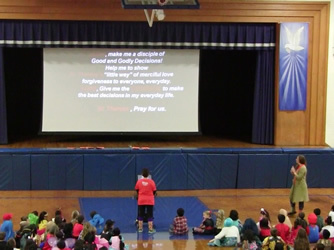 Lastly, Mrs. Paras helped us to renew our Good God Choices, and we all pledged to CHOOSE RESPECT every day, and in every way. 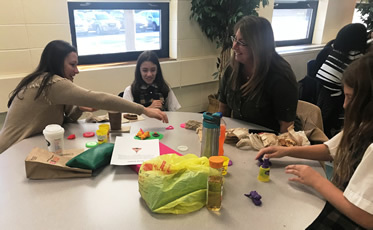 Thank you to the fifth grade parents for taking the time to visit our fifth grade students during the school day on our Parents Day. We enjoyed becoming electrical engineers together as we built working circuits, battling each other with multiplication, and building Native American scenes with playdoh! Some of our parents may have been convinced to buy a pet or place a TV in their child's room when our fifth graders persuaded them using the OREO method! We are very proud to introduce our Student Council Officers, School Representatives, and Class Representatives for the School Year 2018-2019. Treasurer Alexander D., Secretary Giovanni O., President Layna T., Vice President Adrian P.
The 2018-2019 School Representatives are: Sharbella J. and Sasha S.
Christa A. (6B), Joshua G. (6W), Tommy S. (5B), Makensie M. (5W), Brandon Z. (4B), and Nouralina J. (4W). Congratulations to all who were chosen to represent our school and be our role models to follow our Good God Choices everyday, and in every way. 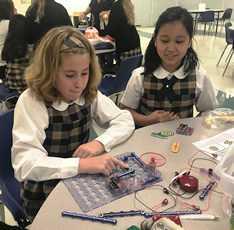 Together with Sister Mary Louise and Mrs. O'Connor, we know that you will incorporate innovative and creative ideas, and add new programs and fundraisers for our school this year. On a misty Fall day, our Second and Third Grade students participated in a Let's Bloom Together Beautification Project by learning about annuals and then planting them behind the Elementary Wing. Marigold Mike entertained and taught the students all they needed to know about bulbs and how to take care of them. Then came the fun part; each student got to become a St. A's gardener, and planted their very own tulip bulb. Marigold Mike told them that "they could come back in 12-15 years, and their tulips would still be blooming!" The students commented on "how much they learned about planting a garden, how funny and awesome Mike was, and how much he loves nature and plants." 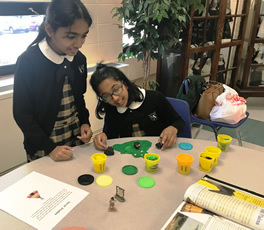 The teachers thought "the presentation was phenomenal and loved that the lesson was interactive and the students had so much fun while learning about plants." We will do an update in the Spring when our colorful tulips bloom! See the full photo album from this great event on our Facebook page! 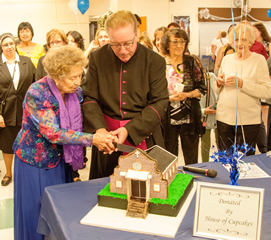 On September 24th, 1958, the St. Augustine of Canterbury Roman Catholic Church was established with Father John J. Reilly as the founding Pastor. 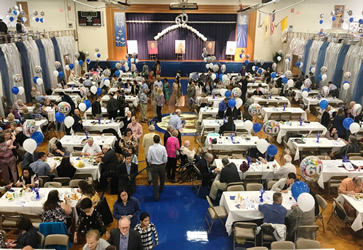 The Parish celebrated this Diamond Jubilee on Sunday, Septembe 23 at our Noon Mass, followed by a reception in our beautifully transformed gym for over 700 parishioners, who enjoyed a delicious meal, and many sweet treats for dessert. 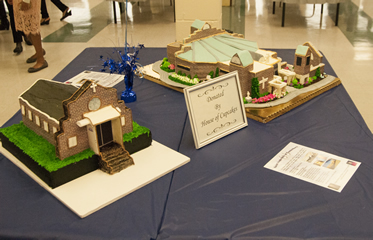 Many thanks to the House of Cupcakes for their incredible recreation of "the Little Church" and the "Basilica of Kendall Park" which was dedicated by Bishop Edward T. Hughes on September 23, 1989. 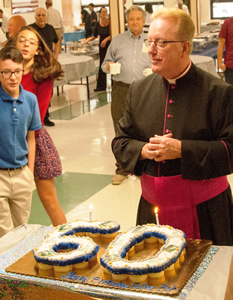 We also had another good reason to celebrate, as it was also our Pastor, Father Bob's 60th Birthday as well. 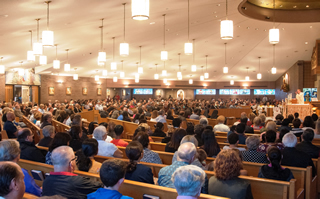 Many thanks go out to Mrs. Federico, and all the many helping hands of our Parish Family Ministry, students and their families, alumni, and anyone who gave of their time and many talents, to help make this a very memorable event for our Parish. On a cool, crisp Fall day, the Snyder Family hosted our Fall Family Festival Fundraiser this past Saturday. It was an awesome family event; from the hayride, to the slide, trampoline, all-terrain bikes, corn maze and corn box, games, activities, snacks, and yes, even getting to pet some adorable animals! Everyone truly enjoyed the peacefulness of the farm, and the companionship of their family and school friends. A HUGE shout out to the Snyder Family for their generosity for being our Hosts for the day, and to the HSA, parents, alumni and students who were our loyal and happy volunteers. Thank you for making this a memorable event for our school. For more great photos from this event, please visit our Facebook page! The St. Augustine School family gathered together to remember those who lost their lives seventeen years ago on 9-11-01. Mr. M. gave a powerful testament about where he was when 9-11 took place, and told us that only Love can replace hate, and gave us a special blessing. Sister Mary Louise also blessed our new NCEA Catholic School Student Assignment Book, in which we invoked the intercession of our Lord and His Mother; "Spirit of Truth, Enlighten my mind that I may acquire a deeper knowledge of You and Your creation; Mary, the Mother of Jesus and my Mother, help me with my studying." We had an AWESOME first day of school as all our students, families, faculty and staff were happy to be back! A big thank you to the South Brunswick Police Department for keeping us safe as we began our new school year. For the full photo album from the First Day of School, please visit our Facebook page!